the truth is (gasp) they probably do, but they just don’t show us that part. leftovers are just part of cooking. people who live in the real world (e.g. not kitchen stadium) need to be able to cook food en masse, and leftovers are the natural byproduct. sure, some people just throw away their scraps. but i bet those same people also blow their noses with money and toss personal checks made out for large sums into wishing wells. part of being a well-trained poor chef is learning to embrace what i call “food alchemy.” alchemists tried to use magic/chemistry to turn lead into gold. in a similar manner, a good poor chef should be able to turn old, crappy ingredients into an excellent dish with nothing more than a flick of your wrist and some elbow grease. learning to cook with leftovers is impressive, easy, environmentally responsible, and an extremely effective way to keep your wallet fat. in short, a great chef should be able to make a beautiful and delicious meal out of high quality, fresh ingredients. but an excellent chef should be able to make a beautiful and delicious meal out of nothing more than what is hanging out in the back of his fridge. and with that in mind, i present to you my signature alchemical masterpiece. remove the peels from the garlic and onion. use a sharp knife to roughly mince both. add a little bit of sesame oil to a frying pan and begin to saute the minced veggies over medium heat. make sure the chicken is cut into bite sized pieces. once the garlic and onion become fragrant but not yet translucent, scoot them to the side of the pan, add a tiny bit more oil, and toss in the chicken scraps. stir the chicken as it cooks. once it is a few minutes from being done, move the chicken to the side of the pan, add another drip of oil, and crack the egg into the pan. scramble it as it cooks. the result will be tiny little granules of egg. finally, mix all the ingredients of the pan together and add the rice. it will probably be all stuck together, so use a rice paddle or the back of a ladel to break up the chunks. adding the soy sauce will also help to soften it up a little. add the sugar and saute everything until the rice is nice and hot. make sure to scrape the bottom as you cook. the starchiness of rice tends to allow it to stick and burn pretty quickly. kill the heat and toss in your kimchi. don’t be shy with the juices from your kimchi, either. 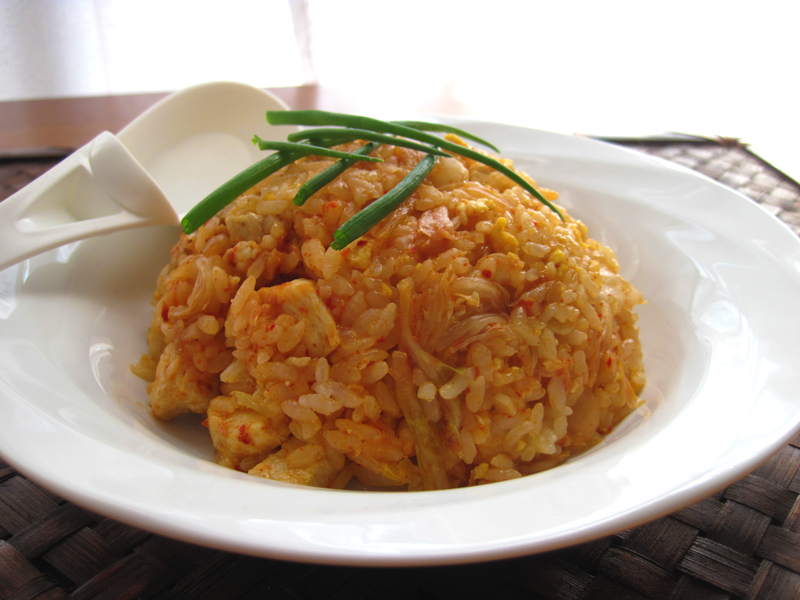 they tend to pack quite a punch and will give your fried rice a little bit extra sauciness. give the whole mix a good stir to heat up the kimchi and get some of that awesome color to rub off on the rice. scoop your alchemical concoction into a rice bowl. place a plate over the bowl and flip the pair so the plate is on the bottom. after a little shake, you can pull away the bowl to reveal a very fancy dome of fried rice. to make it even fancier, you can even garnish it with a few stalks of green onions. This entry was posted in culture, eye candy, japanese food, lunch, tips/advice and tagged Chicken, Easy, Fried Rice, Japanese Food, Kimchi, Leftovers, Rice. Bookmark the permalink. ← chikuzen-ni: easy, peasy, japanesey. This looks so good! I like kimchi and fried rice, why not combine them. Beautiful photos. amanda, it seriously can’t be beat. i really like it with diced chicken mainly because of how light and easy it is, but i have been known on occasion to mix it with leftover shredded slow cooked pork. nira, a.k.a. garlic chives, can also be an awesome addition to toss in right at the very end. they add some much needed earthy greenness to oily fried rice. my mom doesn’t eat much spicy food either, kaori. i feel your pain. we’ve learned to find restaurants that have both spicy and mild food. that’s why we go out for thai and indian food a lot. 因みに, i was wondering if you have any tasty washoku dishes that make you think of home you could suggest. i’m trying to get better at my japanese food recipes, and i need some ideas. if either of them turn out well, i’ll be sure to mention you in my post. 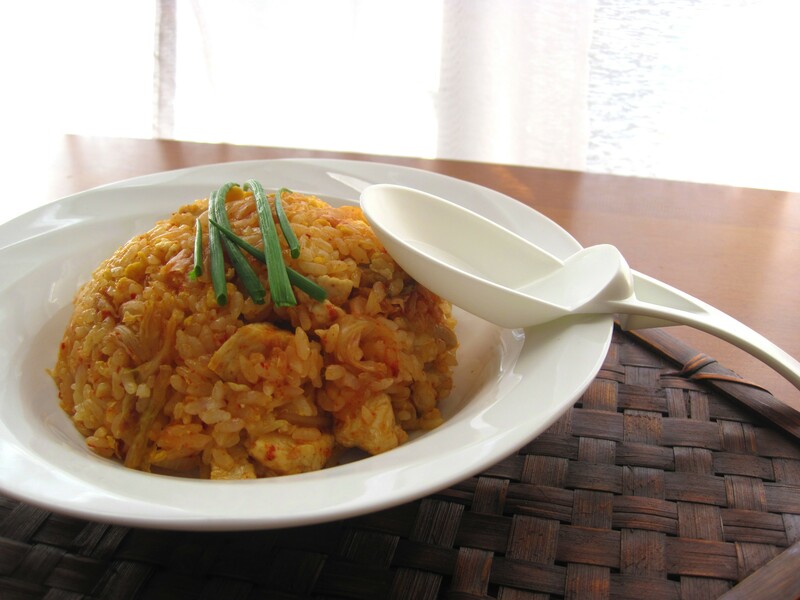 Mmmm, I love kimchi fried rice! I always order it when I see it on the menu of any restaurant but have never tried making it myself. Thanks for posting this recipe. This looks lovely. I have tofu, so I’ll use that instead of the chicken and egg–hope it still turns out well. I just discovered your site by searching for konnyaku recipes, and I love what you’ve done here!